Your air conditioner and your budget...are they getting along? According to the U.S. Dept. of Energy, in nine out of 10 homes (91%), air leakage is at least 150% of the recommended conditions according to government and regulatory standards. This forces installation of larger cooling systems that waste energy, and your money. 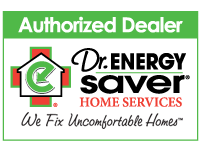 At Dr. Energy Saver, the energy efficiency division of United Services, we take a "reduce before you produce" stance whereby we want to make sure that the systems you rely on for comfort are cooling the inside of your home, not the neighborhood. Once the air leakage is under control, then we can show you the most sensible and effective ways to approach comfort. We will help you understand how your lifestyle preferences, your family's health priorities, and your financial situation can all influence the options that you have available. In many cases, improving the conditions of the home's outer shell will actually help your home comfort system perform better, last longer, and put off expensive replacements for many years. This is the one big difference between us at Dr. Energy Saver and traditional cooling contractors. We listen to you, evaluate the house, and tell you exactly what is going on. The class will discuss the crucial steps in handling fine art and furniture during a property loss. There will be live demonstration on cleaning and caring for items damaged by fire, water, smoke, or other traumatic events. Applicable to licenses from the State of Illinois only for 3 CE credits. Thank you to Bernie's Book Bank for hosting yet another wonderful Book Lover's Lunch. We had a great time and are always proud to be your charitable partner. A big thank you to the LeTip group! Thanks for coming to our Bernie's Book Bank volunteer event on May 17th.